offered a better combination of weight and performance than the equivalent .50" Browning and was one of the best guns in its class. The 20mm ShVAK was also an impressive weapon which first became famous in the Polikarpov 1-16 fighter which saw action in the Spanish Civil War, outclassing other aircraft until the arrival of the Bf 109. It was fitted to a wide range of aircraft including Lend-Lease Hurricanes. In late 1944 the ShVAK was replaced in production by the B-20, which used the same ammunition and had the same performance but weighed a remarkably low 25kg. 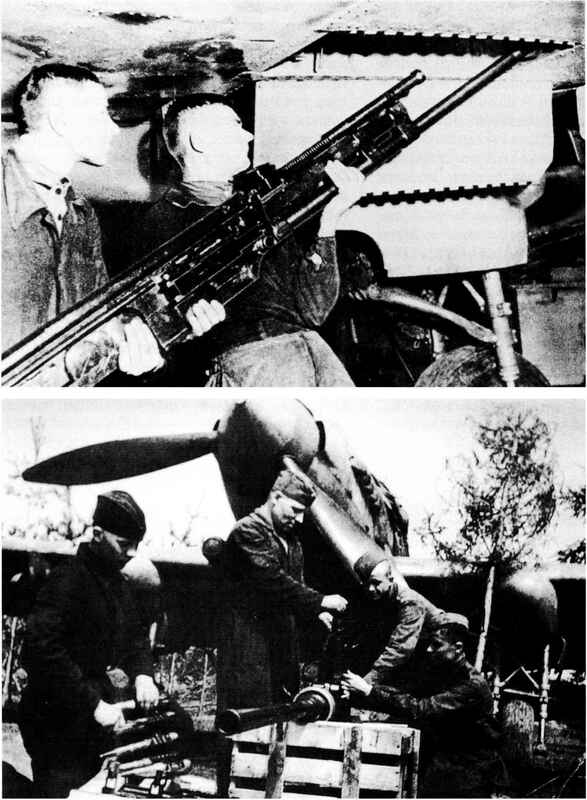 Soviet fighters did not adopt a uniform armament pattern except for the general avoidance of wing-mounted guns (apart from the obsolete 1-16). Vee-engined aircraft such as the Lavochkin LaGG-3 and most Yakovlevs (which used a derivative of the Hispano 12Y engine designed to accept an engine-mounted gun) typically had an engine-mounted 20mm ShVAK supplemented by a pair of synchronised MGs, initially 7.62mm but later 12.7mm. The similar MiG-3, however, used different engines which had been intended for bombers and were not therefore designed to accept engine-mounted guns. In any event, they were initially equipped with only one 12.7mm and two 7.62mm guns, cowling-mounted and synchronised, although some were later fitted with UBs in under-wing gun pods. The La-5 and La-7 radial-engined fighters were fitted with two or three 20mm, all synchronised. One reason for avoiding wing mounting was apparently the inaccuracy caused by wing flexing during flight. However, this emphasis on a relatively light and centrally mounted armament also indicates a strong concern with performance and handling. This suggests that the main priority was dealing with German fighters, which had outclassed their Soviet opponents in the initial stages of the fighting, mainly because Soviet engines were at that time relatively low-powered. but later featuring Nudelman, Suranov and Rikhter - famous names in Soviet weapon design).